Here, there and everywhere in between — the standard 3.6L V6 engine allows for impressive power and available towing capability no matter your destination. Plus, the 9-speed automatic transmission offers the smooth shifting you want and the fuel economy you need. It’s cruise control, only better. This available feature automatically maintains a driver-selected distance from the vehicle in front of you — even during slowing traffic. If Traverse is properly equipped, this convenient feature allows you to adjust your vehicle’s performance on challenging road surfaces with the simple turn of a dial. This available technology automatically switches on the high beams when driving conditions become too dark and switches back to low beams when it detects another vehicle’s headlamps or tail lamps. 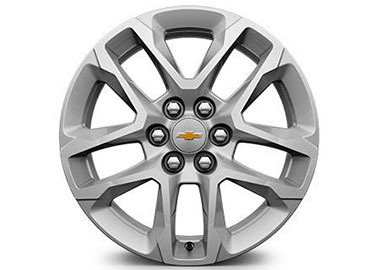 18-Inch bright silver painted aluminum wheels. 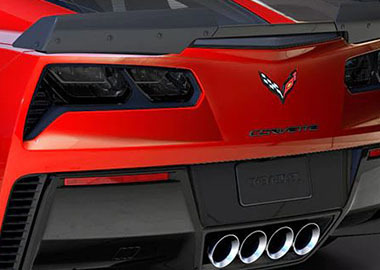 Available Z06-style carbon flash spoiler. Hands full? No problem. You can open the available hands-free gesture liftgate (exclusively on Premier and High Country) with a gentle kicking motion of your foot. To make things even easier, Traverse projects the Chevrolet logo on the ground to use as a guide. The liftgate also features a programmable memory height to accommodate areas with low ceilings. With the touch of a button, the available 8-inch diagonal Chevrolet MyLink® display slides upward to reveal a hidden storage compartment and a USB port. And to help keep your things secure, the compartment can be locked by entering a four-digit PIN. The enhanced Smart Slide® second-row seat on the passenger side can be moved and angled forward, allowing passengers easy access to the third-row seats — even if there’s an empty car seat in place. Talk about convenient. Comfort for everyone with space to spare – that could be the Traverse mantra. This roomy midsize SUV offers best-in-class maximum cargo space of 98.2 cu. ft. and a hidden underfloor rear storage compartment to boot. Using camera technology, this available advanced feature alerts you to slowing vehicles detected in your path. Drivers can set the following front distance indicator to far, medium, near or off. Rear Seat Reminder† can help jog your memory when you need it. The feature activates when a second-row door is opened and closed just before you drive. Once you’ve completed your trip, it reminds you (under certain conditions) to check the back seats using chimes and a message in the Driver Information Center. When you’re parking or traveling at low speeds, this available technology uses strategically placed cameras to create a virtual bird’s-eye view of the vehicle. The system is made up of four cameras – the standard rear vision camera, a forward-looking camera in the front grille and one under each side mirror of the vehicle.